Boring, bland and exploitive; it's everything there is to hate about Pay to Win Games, without having to actually spend any money! An endless horde of tanks lay siege to a path which you must protect. Enemies get stronger and more numerous every wave without any noticable change in visual appearence! 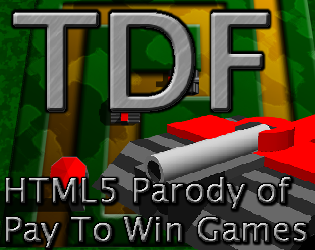 Upgrade your turrets in this endless game of one-upmanship! Sit back and watch your turrets take out enemy tanks! Farm Money from destroyed enemies to scrape by or use in-app purchases to easily progress through the game! TD Forever is available now, FREE for iPhone and Android. How far can you get on the game's leaderboards? No matter how many waves you complete, there will always be an infinite amount of waves left to play.